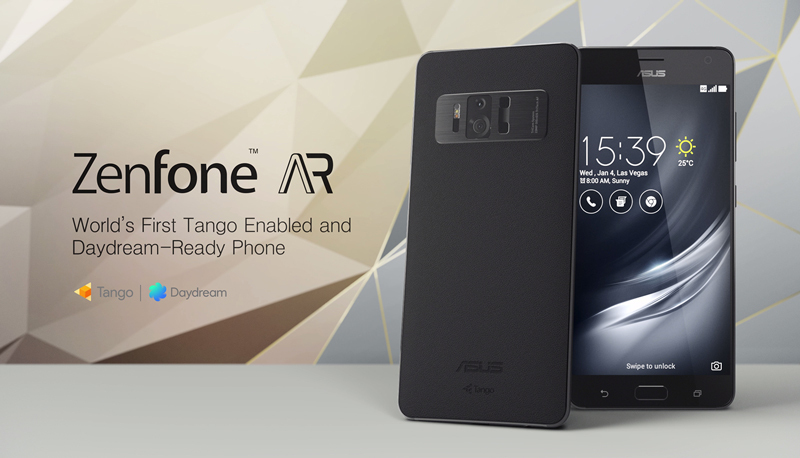 Taiwanese electronics giant-ASUS has launched its flagship Android smartphone called Asus ZenFone AR – the first smartphone in the world which comes with Google Daydream and Tango support. First showcased at ‘CES 2017’ in January this year, the Asus ZenFone AR comes with 8GB of RAM, 28GB internal storage and will be available exclusively via Flipkart for Rs. 49,999 from 4 p.m. on July 13. Users can avail a discount of ₹2,500 on Google Daydream View VR Headset, along with the purchase of ZenFone AR on Flipkart. The dual-SIM (Nano) smartphone runs on the Zen UI 3.0, which is based on Android 7.0 Nougat. It sports a 5.7-inch Quad HD (1440×2560 pixels) Super AMOLED display with Corning Gorilla Glass 4 protection and claims of over 100 percent support for NTSC color gamut. The smartphone is powered and supported by a Qualcomm Snapdragon 821 SoC that’s been optimized for Google Tango and Daydream VR performance. On the photography department, the Asus ZenFone AR sports a 23-megapixel primary rear camera with an aperture of f/2.0, 6P Largan lens, Tri Tech Focus System (dual-PDAF, laser autofocus, continuous autofocus), RGB sensor for color correction, 4-axis OIS for photos, 3-axis EIS for videos, and RAW file support. The company claims the TriTech system can focus as fast as 0.03 seconds. On the front department, it bears an 8-megapixel sensor with a f/2.0 aperture, an 85-degree wide-angle lens, and dual-LED flash. The front camera offers HDR and real time beautification modes. Asus ZenFone AR has all the standard connectivity options include 4G VoLTE, dual-band Wi-Fi 802.11ac, Bluetooth v4.2, USB Type-C 2.0, GPS/ A-GPS, NFC, and a 3.5mm headphone jack. The sensors include an accelerometer, ambient light sensor, barometer, digital compass, gyroscope, an infrared sensor, and proximity sensor. It is powered by a battery capacity of 3300mAh which is a non-removable one with support for Quick Charge 3.0 that with the bundled 18W charger can provide 60 percent capacity in 18 mins.